Local high school students dove into learning about the Bay this June—one of them quite literally. While scanning the beach at Colt State Park for interesting animals to show his classmates, a fully dressed student spotted a horseshoe crab a few yards offshore and enthusiastically pursued it, dry clothing be damned. Students examine a horseshoe crab they caught at Colt State Park. 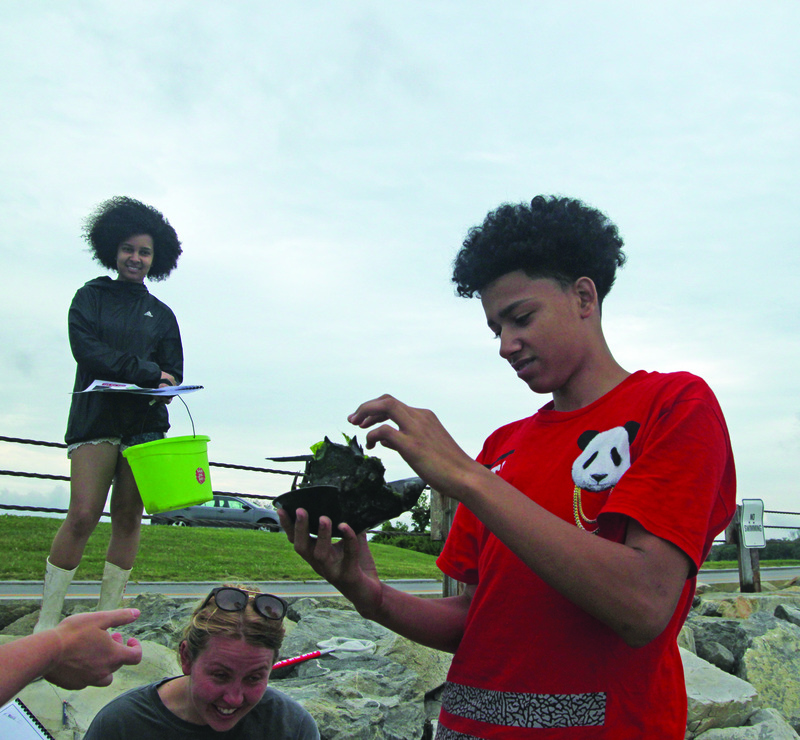 The horseshoe crab-hunter was one of the Central Falls High School students participating in a weeklong educational program with Save The Bay, exploring Bay habitats and human influences on its health. The group visited sites from Lonsdale Marsh in Lincoln down to Easton’s Beach in Newport, where they observed biodiversity, cleaned up trash and put their linguistic skills to the test in a salt marsh-themed rap battle. “Our students going out with Save The Bay and actually seeing the concepts they’re reading about gives them a tangible piece to understand environmental science,” says Laura Stanish, Central Falls High School science teacher and partner in Save The Bay’s education program. The Central Falls High School campers are part of the 600 students who participate in Save The Bay summer programming and the 15,400 students the organization sees through the calendar year. For some of the students, these programs serve as a first introduction to Narragansett Bay, which educators leverage to show each person’s connection to the Bay and its health. 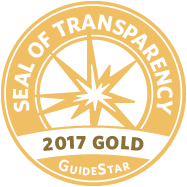 Save The Bay works with school administrators and teachers alike to ensure that programming bolsters the school district’s educational goals. For Stanish, this means that in addition to the brief summer camp, Save The Bay provides real world experiences during the school year to illustrate concepts she teaches in her environmental sciences courses during the school year. Stanish’s students take multiple trips a month to Lonsdale Marsh to survey vegetation, take water quality measurements, assess human impact, and explore the biodiversity of the area—all neatly dovetailing with learning objectives for the class. In addition to collecting actual data on their nearby marsh, students develop learning modules for local fifth-graders and present their data and educational materials to Save The Bay staff at two conferences a year. A canoe trip on the Blackstone River and a boat ride south to Prudence Island teach a final lesson about stewardship: “Our students don’t necessarily think that what they do in Central Falls is going to impact Jamestown or Narragansett down south, but seeing how the waterways all connect makes them more aware of their impact on the world around them,” Stanish says. Central Fall High School students use watershed models to explore their impact on the Bay. 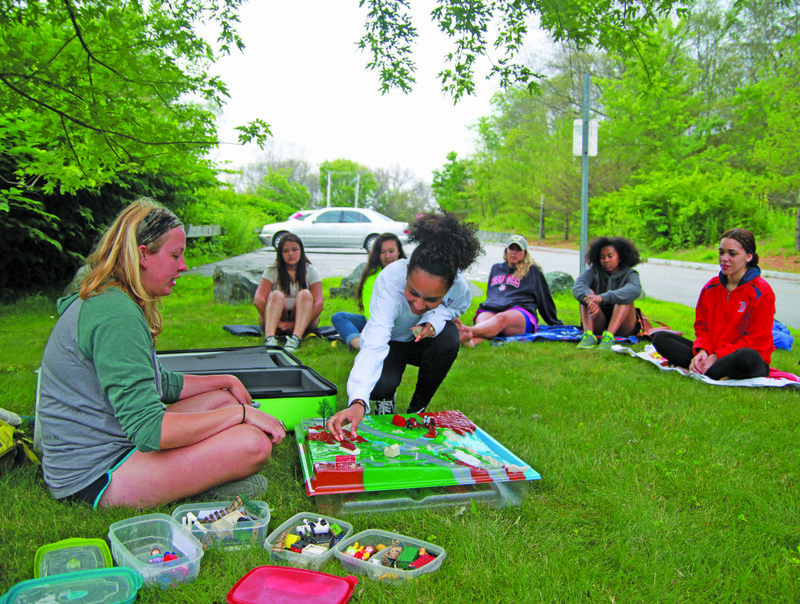 The relationship with Central Falls High School is a shining example of Save The Bay’s educational goals: “We want to develop full service programs that are integrated into the schools’ curriculum—where the Bay, and by extension the watershed, are natural extensions of their classroom,” says Prescott. Funded by a three-year National Oceanic and Atmospheric Administration B-WET Grant, it’s also an example of the type of educational opportunities at risk if federal support of STEM and environmental education efforts diminishes.